I love this game, it is very fun! But it is too easy for me on amateur so I had to set it at professional, but expert is way too hard. On a 1-10 scoring guide, 1 being the worst and 10 being the best I would give it a 10. Packed with exciting new features, brand new graphics and animations, and an engrossing story line, horse sports fans will be treated to the most complete equestrian experience and the most realistic horse simulation ever seen in a game. 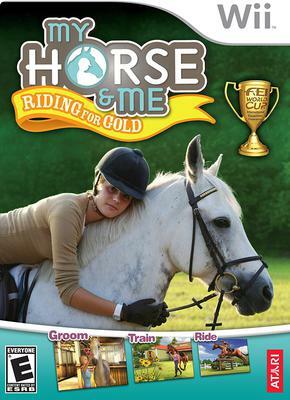 My Horse and Me: Riding for Gold will let players live the ultimate bond between them and their horse. I must say, I've seen a lot of comments saying "Should I get this game?" "Does it have... etc.?" so I'll do a full on review. This game is very realistic (I ride horses at a barn similar to the one in the game), however it has slight elements of girliness. I'm not too bothered by it, but some may be bothered. Now, the customization of the horse is not as detailed as Pony Friends 2, but it's not as uncustomizable as Barbie Horse Adventures. Sadly, you can only own one horse, and I truly hope that if they do make another one, they will expand on that. Also, this is not for those who like trekking horse games, because the free ride area is not endless or huge. Though the mini games are fun! Now, the main storyline is saving the ranch through a large amount of eventing competitions. For those who don't know, eventing consists of three different parts: Show Jumping, Dressage, and Eventing. This part of the game is extremely fun and enjoyable! The other awesome part is taking care of your horse. Its very realistic, and there is much to do. I enjoy it a lot, especially after a hard day of competing! Also, it says you can train your horse, but that's more like lessons. Your horse is pretty perfect, it's mainly just for you. Overall, this game is AMAZING. I HIGHLY recommend it! this game is meant to be epic! I think I'm going to get it for Christmas! I was looking on this website and I freaked out and showed my dad then he said what's it called? My Horse And ME. He wrote it down on a piece of paper! I hope I do get it for x-mas! I love to read other peoples comments on just about everything! This game sounds good! Once I get it I will make sure to post my opinion on it! I'm thinking of getting this game but I'd like to know first, can you customize a horse? And how many terrains are there? I have a dream horse and I'd like to create it. In Barbie Horse adventure on PS2 what I liked most was being able to create a horse and then ride through all these beautiful terrains. i am looking for a European one of horse and me 2 let me know if you want to get rid of it thanks. If you have bought My Horse & Me 2 for wii and think, "well, this ain't that great... the controls are to hard" then buy My Horse & Me (the first one) for wii coz that one is AMAZING!! The controls are sooooo easy for that(amateur) so that is your ideal game! p.s: my real horse Joey is so cute so it's just like i wanna make him a virtual horse on this!!! i can't wait to play it all. those comments made me beg my dad to death so i could get it and i hope he says YES!!!! hey i am a horselover! all you could do was brush and ride THAT'S IT AND I WANT MORE!!! you couldn't even do dressage you can only do show jumping, it get's boring in 10mins. this one looks A WHOLE LOT BETTER!! so i am getting my horse & me: riding for gold like RIGHT NOW!!! how do i get it and how do i see the price? How do I get to the competiton?? How do I get to the competition? I don't know how to walk the horse to the trailer. Thank you! This is a wonderful game and i'm hoping that mroe will come out!! it's ok but some parts are very hard!!! u go to the competitions by walking ur horse over 2 the trailer. This game is easy but how do you get to the competition? I guess... I'm getting My Horse And Me 2 wii in a couple of days time and i have been reading the Amazon reviews for no. 1. It has a low-star-rating. It says that the controls are really tricky and that it is relly hard to play. Hope you understand... I'd not get this gam becose it has not good graphics. Really Great Game, But I Have A Question! I love this game! But my question is, how do you enter competitions?